If this little pony and cart are to be played with in the house you can make it the size marked in Fig. 102 but if it is to be used out-of-doors then you should make it twice the size. Get a nice smooth board 1/2 an inch thick, draw on it a horse, at least as good as the one shown in the picture, and then saw it out. Paint it any color but red or green, for ponies, even in little picture books, are never of these colors. Make a frame 1 5/8 inches wide and 4 inches long by nailing two strips of wood 1/2 an inch square with a block of wood 1/2 an inch square and 1 inch long between them. This leaves an opening 1/2 an inch wide and 1 3/4 inches long as shown at A. Saw out of a piece of 3/8 inch thick wood a wheel 1 inch in diameter and drill a 1/16 inch hole through its center. Set the wheel in the opening and drive a wire nail through the frame and the center of the wheel for it to run on. This done nail, glue or screw the horse to it as shown at B. Make the cart next, see C, which is simply a box made of 1/4 or 3/8 inch stuff, 3 inches high, 4 inches wide and 6 inches long. Nail a strip of wood 1/2 an inch square and 4 1/8 inches long on the bottom and in the middle of it. Saw out a pair of wheels 2 5/8 inches in diameter and screw them to the ends of the strip of wood so that they can turn freely. Next make the shafts; these are formed of two strips of wood 1/4 inch thick and about 5 1/2 inches long. Nail the ends of these to the front end of the cart in the middle and at a distance apart so that the horse will just slip in between them. Glue, or otherwise fasten the shafts to the horse, as shown at D, and you can then show your little brother how to play with it, but don't break it before you give him a chance to play with it too. 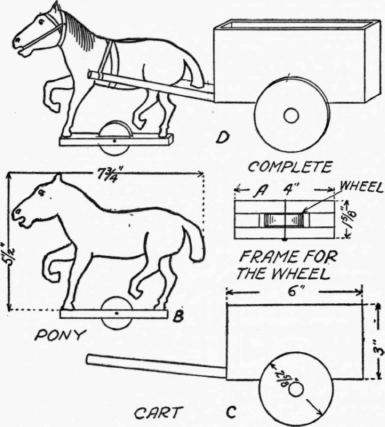 The finished pony and cart will then look like the picture.